I know I'm so behind on posting, so please forgive me. I'm trying to use this holiday season to catch up on all the foodie adventures on which I've been on over the past couple months. So much to share, but so little time to get it all right! I'm a slight perfectionist--I would rather not post any content until/unless I'm happy with it and have done enough background researching to be able to speak thoroughly about it. I definitely wouldn't want any details to slip through the cracks! The bean counting world is about to enter its busiest time, so the hiatus may continue well into late winter/early spring. 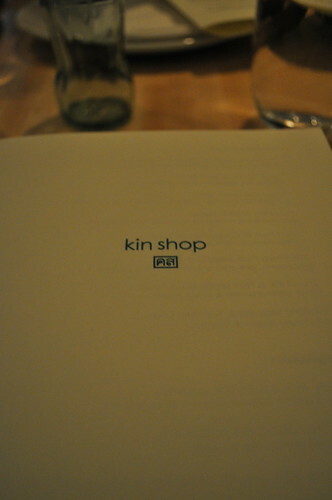 Anyways, I did want to post about my visit with Marcus to Kin Shop (as recommended by Marcus's manager), opened by both Top Chef Season 1 winner, Chef Harold Dieterle, and restaurant hospitality honcho, Alicia Nosenzo (Beanstalk Restaurants, Perilla). 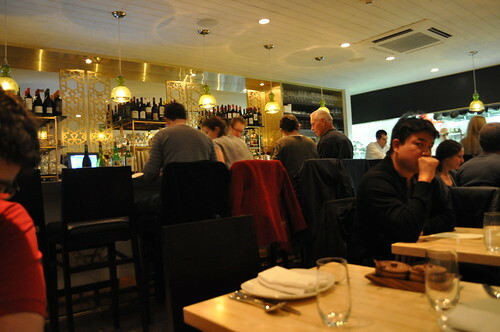 Along with their neighborhood restaurant, Perilla, Kin Shop is Chef Dieterle and Ms. Nosenzo's second restaurant opened since winning Top Chef back in 2006. This restaurant's focus is Thai-inspired modern cuisine. The name is quite clever, too--kin is Thai for "to eat" and is also "kin" to Perilla. A nice touch. Kin Shop has a nice, intimate bar area. I like the mirrors and its overall design elements. The restaurant is quaint and small in size, which seems to emphasize the "neighborhood" restaurants created by the partnership created by Chef Dieterle and Ms. Nosenzo. 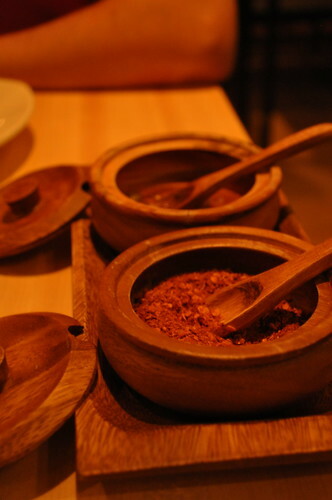 At each table, there are two small wooden containers (very organic and apt to the decor) containing some house-made spices (Thai-inspired chilis, I presume). As you can guess, Marcus was all over that. 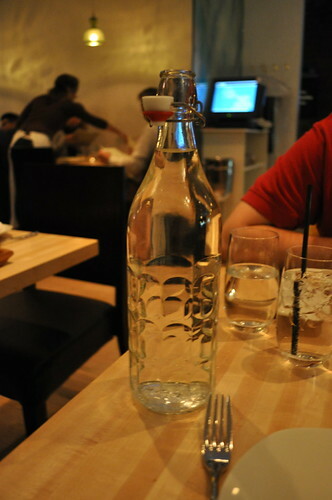 I love the glass swing-top bottles that contemporary restaurants offer with still water--makes drinking tap water a little more elegant! As our first course, Marcus and I ordered two appetizers. 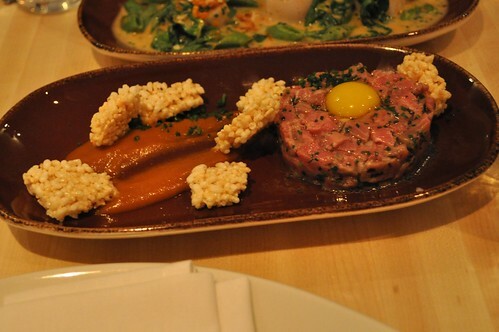 This one here was the hand-cut beef tartare salad with chili jam, rice crackers, quail egg, and mushroom soy dressing. 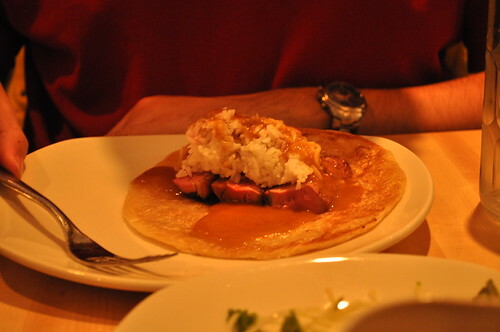 The beef used in this dish is from Wagyū-bred cattle. The meat from this type of breed is known worldwide for its marbling characteristics (i.e., the intermixture of fat and lean in a cut of meat), quality from naturally enhanced flavor, tenderness, and juiciness. I really enjoyed the interplay of textures from the runny yoke, the beef's rawness, the rice cracker's crispiness, and the dressing's thicker consistency. The Thai influence here came from the chili jam, which gave the dish an added dimension of flavor. It was refreshing to see a beef tartare dish executed with such interesting elements from Asian cuisine. 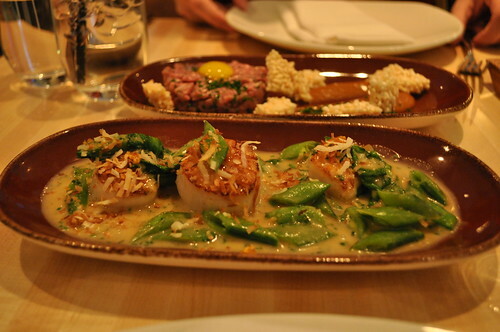 The second appetizer was warm-sliced snap peas and Diver sea scallops with crispy shallots, pea greens, and toasted coconut. The scallops were nicely seared and had the added crunch from the shallots and snap peas. The added coconut flavor came in form of the creamy sauce pictured above, though my only complaint was that it was a tad bit salty. Besides this, these two dishes made for great starters at Kin Shop. These dishes are definitely recommended! As our entrée, Marcus and I shared the Red curry, made from a paste (noting all pastes used are made in-house) containing dried red chilies, sumac, dried shrimp paste, white peppercorn, kaffir lime, cilantro stems, coriander, lemongrass, galangal (Asian perennial with aromatic roots), shallots, and garlic. It is prepared by frying the paste in duck fat (delicioso!) and simmering in chicken stock, palm sugar, fish sauce, tamarind water, and green mango. After this process is completed, the concoction is then puréed. 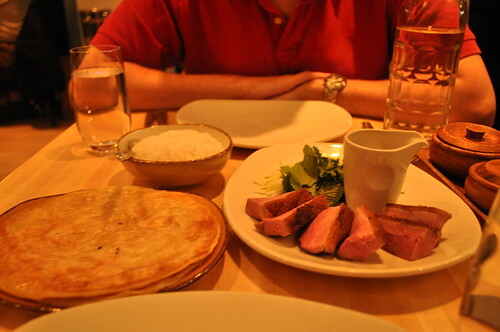 The curry (in the small pitcher) was served with roasted duck breast, crispy roti (i.e., a flour-based Southeast Asian flatbread), green mango, fresh herbs, and tamarind water. We weren't really sure how to eat this, but it seemed easy enough. 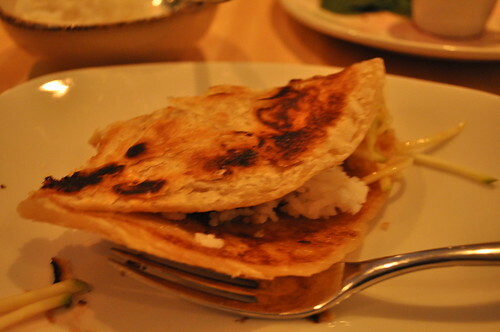 The roti appeared to be used kind of like a taco shell used for ground beef or a Mandarin pancake for Peking duck, so we just did the best we can. Marcus put a mountain of rice over a few pieces of duck, pouring a sizable amount of curry over it (plus some of that mystery chili powder at the table). It was super spicy for him, but he enjoyed it anyhow. Above, I put the Julienned green mango, Thai basil, a piece of duck, a little bit of rice, and a few drops of curry (I was wary of the red chilis used to make it) into the roti and ate away. 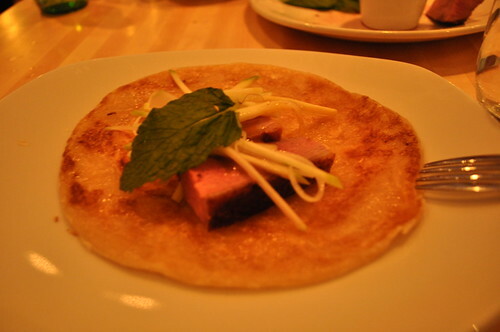 The roti was fittingly pan-seared with the right amount of oil where it had a slight crunchy softness to it. The red curry sauce really brought out the taste of the duck, and the spiciness was offset by the rice I placed in there (I was wary about the amount of red chilis contained in the curry). This Thai version of tacos was delicious, and being able to eat with our hands made the experience very relaxed and authentic. For dessert, we went straight for the exotic ice cream and sorbet flavors offered (though the steamed passion fruit pudding was also tempting). I'll start from the bottom, going clockwise. The first ice cream we tried was kaffir lime flavored. A lime native to Southeast Asia, this flavor mixed in with the elements of ice cream immediately struck me as tasting like Fruit Loops in milk--you know, like the leftover milk in the bowl after eating every morsel of that popular kids' breakfast cereal. I couldn't find a better way to describe it. The second ice cream we tried was Thai iced tea flavored. As one of Marcus's favorite beverages, it is a strongly brewed red tea (that may include added orange blossom water, star anise (aka, starfruit), crushed tamarind seed, red and yellow food coloring, and other spices) sweetened with sugar and condensed milk, served chilled. The color of the ice cream is very reminiscent of the actual Thailand beverage, and we both enjoyed this flavor the best. It encapsulated the flavors of a Thai iced tea in ice cream form--refreshing and delicious! 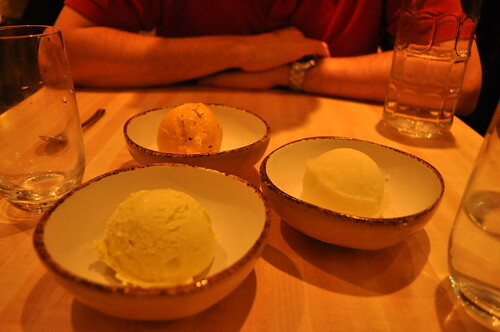 The last flavor of sorbet we tried was calamansi (i.e., a small citrus fruit native to the Philippines), which tastes like the citrus fruit found closest to its rind--kind of like the "underdog" flavor/part of all citrus fruits. I found this to taste a bit tart (mainly because I'm partial to berry-flavored things), but Marcus enjoyed this one as he's a big fan of citrus flavors. All in all, the offerings on Kin Shop's dessert menu (others included galangal ice cream as well as pineapple-tamarind and lychee sorbet) were pretty original and native to the Southeast region of Asia from which the chef draws his influences in the restaurant's cuisine. Findings: I have to admit that I was a bit shocked that an American chef (way to go, Chef Dieterle!) was able to create and execute a menu that draws influences and salutes Southeast Asian ingredients and cuisine (mostly from Thailand, of course) in a manner that doesn't show the chef is trying too hard. Judging from the dishes we ordered, the chef thoughtfully considered the classic and typical dishes prepared in Southeast Asia, while adding his own personal twist. 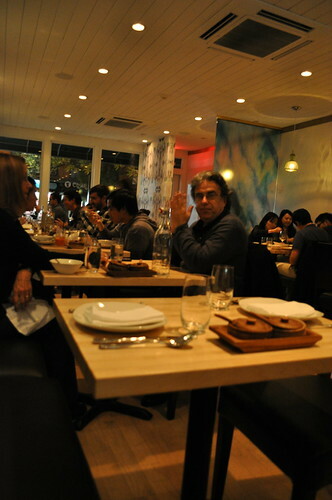 He kept the ingredients authentic, the ode to the original dishes gratuitous, and his personal additions/tweakage in synergy. Plus, I forgot to mention that the service is great here--our server was very helpful in helping us decide on what to order that evening (she was very honest and shared with us what was popular at the moment). I love the name he and Ms. Nosenzo chose for the restaurant, for you will not fret, not even for a second, whether you will eat something worthy of sharing to your dearest and closest at this establishment--in fact, it is a given. Just ease yourself into the spicy dishes--you'll be glad you did! Price point: $14 for each appetizer, $24 for main course, $3 per scoop of dessert.